Main Phase: Exhaust another one of your characters and pay 1 action token to add its power to this card until the end of the turn. The only ponies around who would actually WANT a cutie mark of themselves are Diamond Tiara and Trixie. 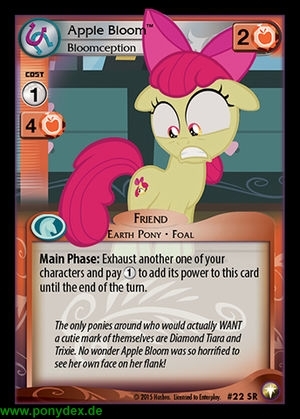 No wonder Apple Bloom was so horrified to see her own face on her flank!